One of the camp's attractions is the outdoor dining area. Wooden decks have been built on the floodplains and dinners under the stars are a wonderful experience. Little Vumbura is a special very small camp accommodating 10 guests on a wonderful island. Its sister camp Vumbura is located in the same region in the Okavango Delta. The focus at Little Vumbura is on water activities as the camp is surrounded by water and close to permanent big and fast flowing rivers. However, game viewing by a four-wheel drive is another activity you should not miss while in Little Vumbura. 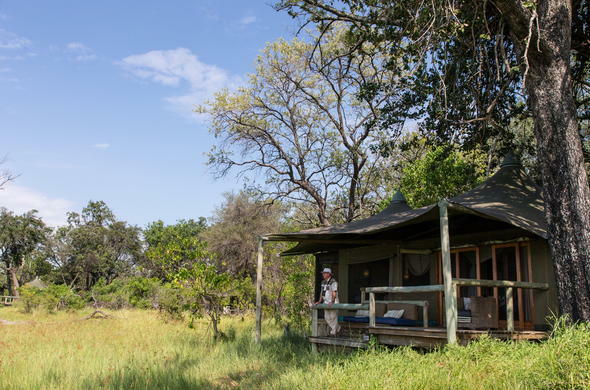 Little Vumbura has 6 tents under an enormous canopy of ancient Okavango forest with Ebony, Marula, Knobthorn, Garcinia and Fig being the dominant trees. Attractive palms give the island a wonderful tropical feel and bring the Elephants onto the island, especially towards the end of winter. Each tent is large and roomy and has en suite facilities, as well an outside shower for those who want to be even closer to nature. The dining room and pub are under canvas and have been built in and around the existing trees. There is a pool and a 'sala' for relaxing and reading in the quiet of the day. Vumbura offers mokoro (dugout canoe) excursions, walks, boating and game drives. Game drives are conducted in open 4X4 Land Rovers with experienced guides. Night drives are possible nearly all year, but may be restricted for a few months in the middle of each year if they have extremely high flood levels. The variety of wildlife here is stunning. Guests can go out by boat in the morning and see Hippos, Crocodiles, Red Lechwe and all the aquatic wildlife and then travel out by Land Rover in the afternoon to see Elephant, Sable and all the dry savannah game. Although Sable Antelope males are territorial, they very rarely engage in violent encounters. They prefer ritual displays such as standing tall with their necks arched when it comes to defending themselves from any would-be opponents. The Okavango is an incredible life source in a country that is 80% arid. It is a unique ecosystem of permanent waterways lined by shady forest glades and seasonal savannah floodplains interspersed with water-lily lagoons and palm tree islets.